What Is in the Fisher Price Imaginext Toy Line? Fisher-Price Imaginext products are designed to encourage pretend play in children ages 3 to 8. They are more lifelike than the Little People toys designed for toddlers, but easier to use than play sets designed for older children. 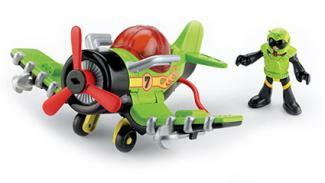 Fisher-Price has released several Imaginext lines based on popular movie and television characters. The DC Super Friends line is a large collection of products that features Batman and other popular DC Comics characters, including Green Lantern, Superman, Joker, and Penguin. The Batcave is the centerpiece of this line and features interactive gadgets such as a mechanical claw to pick up the Batcycle and a telescope to keep an eye out for bad guys. Toys R Us customers say it's easy for kids to play with independently, although they caution that keeping track of the small pieces can be challenging for younger children. Toy Story sparked the imaginations of children around the world with a collection of toys that come to life, so it's not surprising that this popular movie became the basis of an Imaginext product line. The vehicles are the stars of this collection. Evil Dr. Porkchop's spaceship, the Tri-County Sanitation garbage truck, and the Pizza Planet pizza truck will make your child feel like he's stepped inside the movie. These products are popular with parents who have rated them highly on Amazon, noting that the toys are sturdy and look just like the vehicles in the film. The Disney Pixar Monsters University collection of Imaginext products features Sully, Mike, Randy, Johnny, Chet, and Omar. The collection isn't as large as the DC Superfriends line, but it's still worth a look. The Scare Games play set, which requires two AA batteries, will provide hours of fun for fans of the popular movie. It features scream sounds and phrases from the movie, as well as glow in the dark orbs that kids can launch at targets. 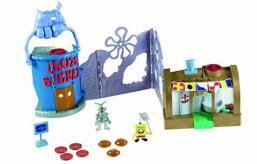 The SpongeBob SquarePants collection is also quite small, but does a wonderful job of replicating sets from the show. The Krusty Krab play set gets a 4.4 rating from Toys R Us customers, with 89% of reviewers saying they'd recommend the toy to others. The set gets especially high rankings for being well made and easy to set up. If you are trying to avoid encouraging your child to play with toys that feature licensed cartoon characters, Imaginext also offers a wide variety of classic toy themes. 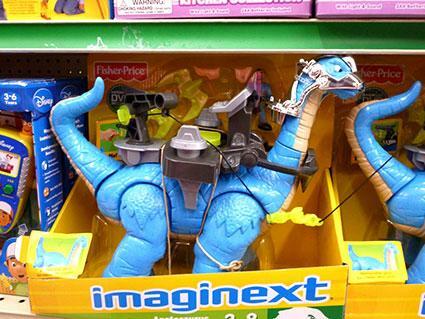 The Dinosaurs line is a little different than other Imaginext lines because it doesn't include any play sets. The line is simply a collection of different dinosaur figures, such as a T-Rex, Apatosaurus, Stegosaurus, and Triceratops. Fisher-Price reviewers call the Apatosaurus the best of the collection, giving it a 4.5 star rating for its detailed articulation and sturdy tech gear. Kids who love tales of adventure on the high seas will be thrilled with the Imaginext Pirate collection. The pirate ship features details such as cannons that can be fired with the push of a button and sails that can be lowered by turning a figure from side to side. The pirate whale is also sure to spark a child's imagination, since it's fierce but not overly frightening. The Imaginext Castle line is straight out of a fairy tale. There's a scary ogre and a flying dragon that can be defeated by the castle catapult. The Imaginext Eagle Talon Castle is designed to recognize and respond to different accessories within the line and features an eagle's head that is ready to fire at the enemy. The Eagle Talon Castle is one of the most expensive Imaginext toys. However, it's also one of the few products to get a perfect 5 star rating from Fisher-Price customers. Sky Racers are pilots who operate various aircraft. The air tower and Sky Racers carrier play sets serve as anchors for this collection by providing a runway for takeoff and a method of air traffic control. Many of these products received perfect five star ratings on Amazon, due to their kid-friendly design and abundance of interactive features, such as rescue rafts that can be picked up by the plane. Target shoppers will be pleased to hear that some Imaginext products are available exclusively at Target stores. The Imaginext Samurai Castle line brings a ninja twist to castle play. The samurai and ninja warriors are ready to fight in a castle with a zip line that figures can slide down and a lever that slides back and forth to simulate battle action. Target customers give this castle play set 4 out of 5 stars, saying it's easy to assemble and very sturdy. 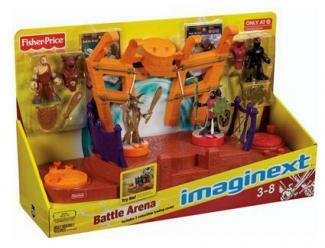 The Imaginext Battle Arena has a stage with sound effects so various characters can fight each other. This set is sure to be a hit with older children, but parents who are concerned about toys that promote violence may want to steer clear in favor of one of the other Imaginext product lines. Fisher-Price is always reevaluating the products in the Imaginext line. Over time, sets are discontinued as new toys are introduced. Popular discontinued items can often be found on auction sites or through specialty toy sellers, but you will pay much more than the original asking price. 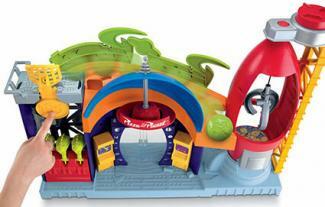 Imaginext Space Shuttle: This plays encouraged kids to pretend they were going into outer space. Other items in the collection included the Space Station and Space Hauler. Imaginext Firehouse With Truck: This was part of a line of toys encouraging kids to pretend they were fighting fires. The set features an extendable ladder, retractable hose, and figure activation point for playtime fun. Imaginext Dragon World Fortress: The dragon castle featured a fierce guard dragon with sound effects and a cannon that kids could fire at intruders. Spike the Ultra Dinosaur: This large remote controlled dinosaur was a popular Christmas gift for kids in 2008. It featured numerous moving parts including the dinosaur's neck, and lots of sound effects. Imaginext Big Foot the Monster: Another remote controlled toy, Big Foot operated on a similar concept as Spike the Ultra Dinosaur. He came with a ball which he could throw and play with. The Imaginext sets are all done to the same scale, so kids can mix and match characters as desired. The characters from SpongeBob can take on a gang of pirates or Batman can do battle with a scary dinosaur. The beauty of the Imaginext product line is that you're only limited by your child's imagination.